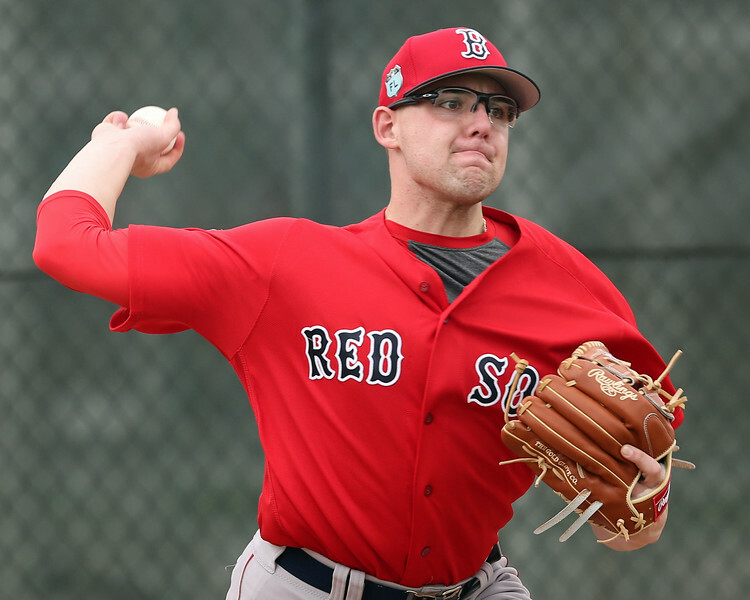 PORT CHARLOTTE, Fla. -- On Friday of the staff trip to minor league spring training, Director of Scouting Ian Cundall journeyed up to the Rays’ complex to take in the Red Sox High A and Low A games. Here are his Notes from the Field. - The main reason for our journey up to Port Charlotte was to see the Spring Training game debut of 2016 first-round pick Jason Groome pitch in the Low A game, and he didn’t disappoint. Groome threw 2 2/3 shutout innings, allowing only one baserunner on a walk and striking out two. Groome’s delivery is remarkably easy, and he has an ideal pitcher’s frame. Groome’s fastball sat 90-92 mph for the first inning before dropping a tick to 88-90 as he got deeper into outing. Even at that velocity, he was able to be effective as he was pounding the lower part of the strike zone, especially in the first two innings, with the pitch showing late life and run. Groome has shown more velocity in past looks, but as this was his first outing of the spring, the slightly lower velocity is not a concern. Going forward, Groome could hold his velocity and have better command of the pitch while sitting in the low-90s, but still dial it up when necessary to the 94-95 range on occasion. Groome’s primary secondary pitch is his curveball, with which he recorded both of his strikeouts while flummoxing the young Rays hitters. He has remarkable feel for the pitch for his age and snapped off some easy plus breakers during this outing. The pitch ranged from 74-78 mph with tight rotation and depth. He was able to throw it in the zone for called strikes or out of the zone for missed swings, and he clearly has supreme confidence in the pitch. It is a true weapon and the best curveball in the system right now. Groome also mixed in his changeup, and it looked better than when I saw him last year. He only threw a handful, but he showed more feel for the pitch over time and actually got a couple swing-and-misses on it. He threw it 80-82 mph with the same arm speed as his fastball. He turned it over down in the zone, with the pitch showing late fade away from the barrel. At that velocity, the pitch has good separation from his fastball and looks like it can develop into at least an average offering. - 2016 fifth-round pick Mike Shawaryn started the High A game and got hit around some, giving up some loud contact including a home run to a left-handed hitter. Shawaryn came out throwing hard, sitting 92-94 mph with his fastball showing sink down in the zone. As the outing went on, his velocity ticked down, and by his third inning of work he was sitting 88-91 mph. Shawaryn has a starting pitcher’s frame, but his delivery has effort and his low-three-quarters arm slot gives left-handed hitters a good look at the ball, both factors that lead to questions about whether he can stick as a starter long term. Shawaryn featured three secondary pitches—a slider at 83-87 mph, changeup at 84-85 mph, and a curveball at 77-78 mph. The slider showed short, tight, horizontal movement at higher velocities, but more vertical movement in the lower band of the velocity range. He threw his changeup with deceptive arm speed and the pitch showed some late fade, but it was inconsistent. Interestingly, the curveball—a pitch you would not expect to see thrown from an arm slot as low as his—was not a pitch he featured last year in Lowell. He only threw it a few times, so it could be something he is for strikes trying out or only using as a show-me pitch, but it bears watching to see if he continues to feature it in the regular season. - Left-hander Yorvin Pantoja (pictured), who threw in the Low A game, looks like a reliever, at a small, skinny, listed 5-foot-11, 175 pounds with effort in his delivery. His fastball sat 89-91 mph, touching 92, with some sink coming from a three-quarters arm slot. Pantoja has a quick arm, and his delivery has some deception as he turns his back to the hitter, keeping the ball hidden, before coming to the plate. His changeup showed some potential at 80-81 mph with late fade and good arm speed. His curveball was loose and slurvy and lacked tight rotation. - Signed as this offseason after spending last year in indy ball, right-hander Mitchell Osnowitz showed off a strong arm in a quick inning of relief to finish out the High A game. He has an intriguing background, having only converted to pitching after being drafted in 2014 after playing third base in college. Osnowitz has a big pitcher’s frame and jerky delivery, but intriguing raw stuff. His fastball sat 93-96 mph with life up in the zone and he paired it with a cutter at 90 mph and slider at 87 mph. Both the cutter and slider showed hard bite, with the slider slightly longer. - Outfielder Ramfis Berroa signed late out of the Dominican Republic as a 19-year-old and has spent the last two years in the Domincan Summer League, but he showed off a pair of intriguing raw tools. Berroa has a solid outfielder’s build, listed at 6-foot-2, 190 pounds with minimal remaining projection. In batting practice, Berroa showed off plus raw power to the pull side, and during the Low A game on Thursday, Berroa hit a towering home run to left field on a fastball. Berroa has a long swing and doesn’t get cheated. He struggled with pitches away over the week and looked to pull the ball in the air. In the games on Friday, he made a perfect throw to the plate, showing off a plus arm from right field to throw out a runner attempting to score. With plus raw power and a plus arm, Berroa is somewhat interesting given the system’s lack of outfield prospects, but his approach needs a lot of work and swing-and-miss will be an issue for him going forward.